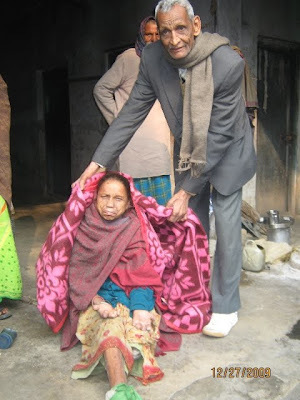 Indian Development Foundation organised blanket distribution to poor and needy leprosy patients at Dhaka Kushthashram at Purvi, Champaran, Bihar. 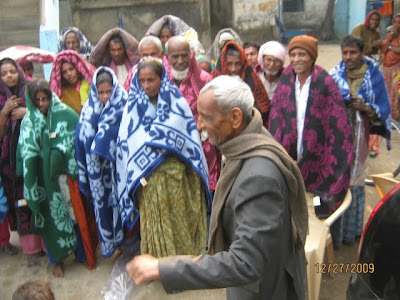 Mr. Thomas, Gen. Secretary, Kust Niwaran Society, Patna organised in distributing the blankets to the needy leprosy persons. An Act of Kindness. IDF thank its donors for coming forward to provide warmth to the patients in dire need. 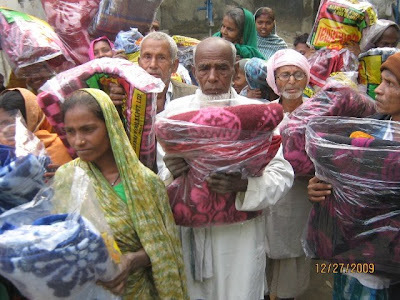 This is the first phase of distribution, many more to go.......If you have missed the opportunity of providing warmth and love......You can certainly grab one during New Year 2010. 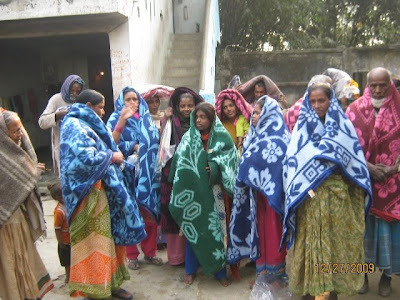 Donate Rs.200/= per blanket. 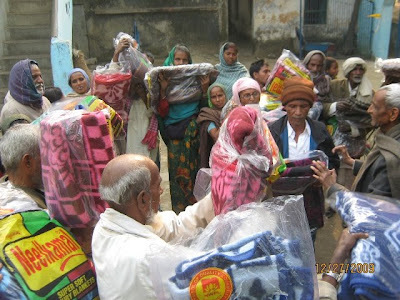 Send your contributions to IDF for further despatch to the needy people in Northern India. Indian Development Foundation organised Christmas Celebrations with leprosy patients at Vimala Dermatological Centre, Versova, Mumbai on 22nd December 2009. Citizens from different walks of life participated in the programme and shared joy with the inmates and children of the Centre. FOR MORE PICS - CLICK THE LINK. Indian Development Foundation (formerly Indian Leprosy Foundation) will be organising a Citizen's Reach-out Programme on 22nd December 2009 (Tuesday) at 4:30 PM at Vimala Dermatological Centre, Versova, Yari Road, Andheri (W), Mumbai 400 061. We cordially invite you and family to participate in this public event and share the joy of happiness. Every year we conduct New Year celebrations with leprosy patients and children of Vimala Centre, distribute gifts, eats and items of daily use. Such Citizens' Reach-out programme has gained momentum over twenty five years now. Citizens from different walks of life will gather at the centre to greet the inmates and children during the festive occasion. Leprosy patients on this occasion get the happy feeling that there are kind-hearted citizens who consider them as part of society and care for their welfare. The citizens-patients interaction during festive occasion has gained year after year. 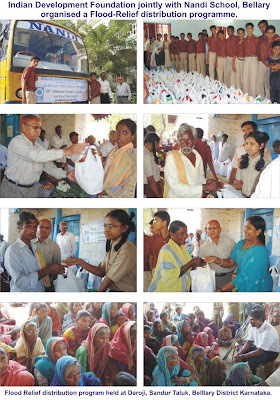 Ingraham Institute, Ghaziabad, Uttar Pradesh supports IDF's health, education and rural development programmes. Dr. Hepesh Shepherd, Director of the Institute congratulated the social work of IDF in the areas of leprosy/ TB programme and felt happy that his students could be a part of the entire social responsibility activities. Mrs. Arpana Ruth, Principal of Ingraham Institute English School - Mrs. Mohini Sampson, Principal, Ingraham English School (GT Road) and Mrs. T Pershad, Headmistress, Ingraham Primary School exhorted the students to come forward and support social programmes of IDF. The students also created awareness on leprosy/ Tuberculosis to the family members and their contacts. Handing over the donation cheques to Dr. Narayan B. Iyer of IDF at a special function organised at Ingraham auditorium on 5th Dec., Bishop Rev. S.S. Singh appreciated the social efforts of all the students in Ingraham Institute and said the contribution presented by the students are like Christmas gifts to the poor and the needy. Dr. Narayan B. Iyer, national co-ordinator, IDF thanked Ingraham Institute for their benevolent social initiative. Pristine Consultancy supports IDF's humanitarian programmes. In one of the recently held workshops in Mumbai, Mr. S.G.Darvhekar, Director General, DGFASLI, Govt. of India, presenting Pristine's contribution to Dr.Narayan B. Iyer, national co-ordinator of IDF. Mrs. Geetha Jayakumar, Director of Pristine Consultancy looks on. IDF thank Mrs. Geetha Jayakumar and team Pristine Consultancy for coming forward and supporting noble causes. Can we say, a pristine social responsibility !!! Indian Development Foundation and Vivek Education Society jointly organized World AIDS Day programme on December 1, 2009 at Vivek College of Commerce, Goregaon West in North Mumbai. About 300 students from Bharati Vidyapeeth University & Dental College, Gokuldham High School, N. M. College of Commerce, S.V.K.M. Law College, Symbiosis Institute of Media & Communication, T.P. Bhatia College, Usha Pravin Gandhi College of Management, Vivek College of Commerce, Vivek Vidyalaya & Jr. College and Yashodham High School actively participated in the event and received vital information on HIV/AIDS. Mangalore Mithr - news portal published the report. - see news item in link given below. For more pictures of the event - click link given below.